Fifty kilometers north of Vancouver, British Columbia, at the head of scenic Howe Sound is the Squamish River System. This large glacier fed stream is home to late running winter steelhead and four species of Pacific Salmon: Chinook, coho, chum and pinks. There are resident and sea running Dolly Varden, cutthroat trout and a few rainbow trout. The Squamish has four main tributaries: the Elaho, the Ashlu, the Cheakamus and the Mamquam. Each has its own unique eco-system. There are also many creeks feeding the Squamish River. Each offers a rearing ground for young salmonids. Extensive logging severely affected the spawning beds of salmonids in the Squamish Valley. Mature trees act as reservoirs, holding back excess water and releasing it slowly. Stripping the large trees from the precipitous slopes of the Squamish Valley caused flash floods which wiped out the limited spawning areas of the small tributaries. Shovelnose Creek is a good example. It is an important spawning tributary for the Squamish River. The lower portion of the creek had a good insect population and it's a vital nursery for young salmonids. A number of years ago a flood blasted a new path in the valley bottom and destroyed the lower reaches of Shovelnose Creek. Fortunately, recent stream re-habilitation has improved this disaster. Commercial fishing and native gill nets in the river were also contributing factors to the downturn in salmonid numbers. Angling hasn't been to blame. Long before salmon and steelhead numbers crashed, sport fisherman were voluntarily releasing their fish. Despite the abuses of man the Squamish continues to offer fair fishing. Work has been done on salmon enhancement in all small creeks of the Squamish Valley. Building the Tenderfoot hatchery and spawning channels on the Cheakamus River have enhanced it's diminished wild stock. The dam on the upper Cheakamus River has kept that stream with a more stable flow. Vital steelhead spawning areas have been closed to fishing and all wild steelhead must be released. A bait ban has protected dour steelhead who are beginning to prepare for spawning. The steelhead in all the rivers of the Squamish Valley are very late running. 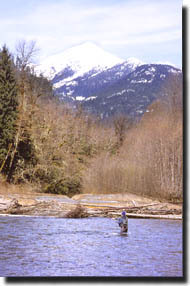 Very few steelhead are seen before the end of February and the main run doesn't begin until April. This leaves a very short steelhead season. In early May the snow pack run-off begins which clouds the rivers with glacial silt. In a cool spring, steelhead are sometimes still caught in mid May. The concentrated steelhead season usually means a lot of fish come into the system frequently. In a few prime locations, steelhead are taken every morning just after daylight. It's not unusual for anglers to have multi-fish days. The Squamish River has been a superb fly fishing river for steelhead. The fish are aggressive and they often hold in the broad, shallow riffles. There are several locations where fly casters often do as well as the gear fishermen. Wilson's riffle near the mouth of the Cheakamus and the Graveyard Run a little farther downstream are good examples. This section of the Squamish has changed dramatically in recent years due to flooding. But, these runs still produce fish regularly. A short distance above the entrance of the Cheakamus, the Squamish River changes from gravel and rock filled runs to a meandering sandy bottom river without many of the classic holding pools. This section of river is filled with sweepers and buried logs. This type of water continues upstream for almost 20 kilometers from the Cheakamus River Bridge. Fortunately, this is also one of the few portions with limited access to the river. The land is mostly private and there is a large Native Reserve in the valley. 18 kilometers above the Cheakamus River Bridge the paved road ends and the Squamish River changes back to the fast gravelly runs that all steelheaders admire. 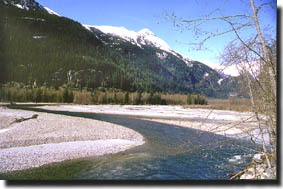 The logging road follows the Squamish upstream for another 40 kilometers and is seldom out of sight of the river. There are numerous access points for anglers, rafters, campers or sightseers. It is a very scenic valley. Snow covered peaks rise abruptly from the valley bottom and a few hanging valleys have year-round glaciers. Blacktail deer and black bear frequent the valley bottom. Mountain goats can often be seen climbing the precipitous cliffs. And, although rare, grizzly bears are infrequent visitors. Even moose are present in the upper valley. The most popular fishing areas on the Squamish are just up and downstream of the Cheakamus outlet, and what has come to be known as the 24 mile section (26 to 32 kilometers above Cheakamus bridge). 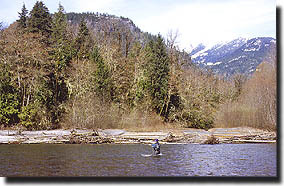 This portion of the scenic upper Squamish has several gravel bars where anglers can camp along the river on weekends. The bridge over the Squamish at 20 mile leads to the only organized camping spot (Buck Mountain Campground) and the Ashlu River. Another six kilometers of pretty water extends upstream from Turbid Creek canyon (40 kilometers above Cheakamus Bridge) to just beyond the Elaho junction with the Squamish. Steelheading isn't as productive in this section but more Dolly Varden are caught there. 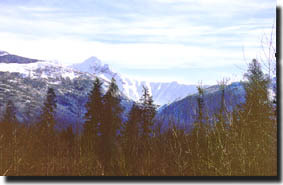 Logging roads extend another 20 kilometers up both the Elaho and Squamish River valleys. Access to the upper Squamish is over industrial logging roads frequented by huge trucks during mid week. Drivers beware! Access to the lower Squamish and mouth of the Cheakamus River is off a rough little road near the power station at Brackendale. Turn left on a gravel road before the power station then right over the railway tracks. Follow the muddy narrow road to the end. There is a tiny parking spot and a rough trail down to the river. Instead of driving, many anglers just fish their way down the Cheakamus to its mouth. 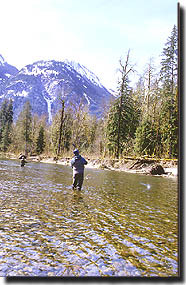 The Cheakamus is an excellent steelhead stream and frequently produces better results than the Squamish. 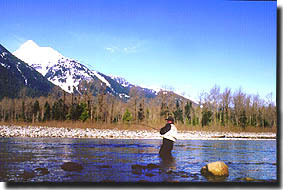 Besides steelhead the Cheakamus supports a hatchery enhanced run of salmon and a few resident rainbow trout. A public road follows the Cheakamus for nine kilometers then changes to a rough B.C. Hydro road for another three kilometers. Beyond that is very rough four wheel drive. There is a rustic campsite suitable for three or four vehicles at the end of the road. Private property extends along much of the Cheakamus but there is fair access at a few locations. Except during high water, the Cheakamus can be waded at the tailout of most pools. Anglers don chest waders and criss cross the river while fishing upstream or down. The most popular fishing section is downstream from the bridge. High water occurs in the Squamish System from May through August and all tributaries except the Cheakamus remain silty until fall. Chinook salmon enter the Squamish in late summer and coho follow them in early fall. The best month for coho is October. Some of the Chinook are huge and often exceed 20 kilograms. The coho are equally robust. Squamish salmon take lures readily and can be caught on a variety of gear. Besides angling the Squamish Valley offers exciting raft, canoe and kayak trips down the river. For people without their own gear there are several local outfitters who offer guided tours. Sunwolf Tours at the Cheakamus bridge crossing and Glacier Outback Adventures, 13 kilometers up the valley, both offer exciting day or multi-day packages. The Squamish Valley is world famous for its population of bald eagles and a wildlife reserve has been set aside for them. Besides the resident eagles, hundreds of migratory eagles arrive in late fall and early winter. It's not unusual to see a dozen eagles in one tree. Every year there is an annual eagle count and bird watchers from all over the country take part. A small sampling of what the valley has to offer can be had on a day trip from Vancouver. But, a week can easily be spent without getting bored. Just a hike up the back side of the Squamish Chief will occupy a day. This 2000 foot "rock" is a world famous rock climb with many challenging routes.